Are library fines keeping you from your favorite books and movies? 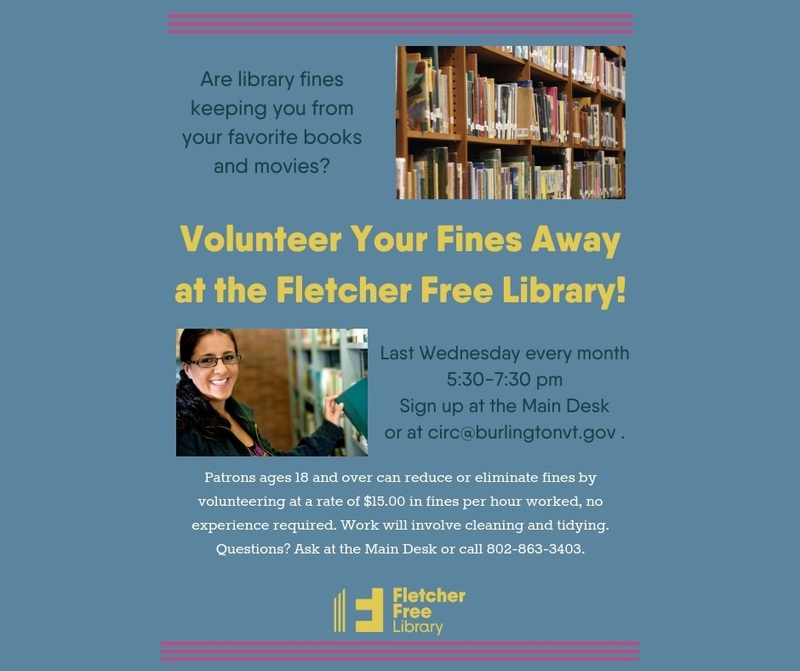 Volunteer your fines away at the Fletcher Free Library! Patrons ages 18 and over can reduce or eliminate fines by volunteering at a rate of $15.00 in fines per hour worked, no experience required. Work will involve cleaning and tidying. Questions? Ask at the Main Desk or call 802.863.3403. Fletcher Free Library cardholders who are 18 and over who have fines on their account may participate. Cardholders under 18 may participate in our Read Away Your Fines program. Which fines may be waived? Unlimited fines on the participating patron's account may be waived; fees up to $50.00 per participating patron's own account may be waived. Can I get credit or reimbursement for fines I already paid by volunteering? Sorry, only currently outstanding fines will be waived. No reimbursement or future credits will be issued.